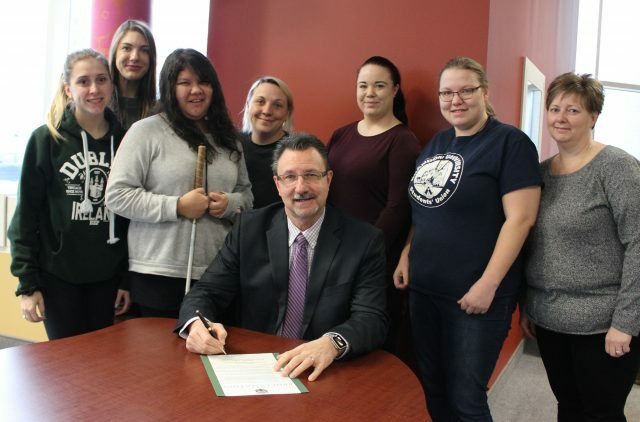 Brandon Mayor Rick Chrest signs a Mayoral Proclamation declaring Access Awareness Week at BU, with (from left) Madison Walker, Morganna Malyon, Andrea McIvor, Stacey Preston, Raquel Wiggins-Smith, Whitney Hodgins, and Michelle Magnusson. 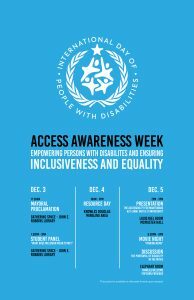 In recognition of the International Day of Persons with Disabilities on Monday, Dec. 3, the Brandon University Students’ Union (BUSU) and Student Accessibility Services at BU are celebrating Access Awareness Week. So that these events may be enjoyed by all, please contact Morganna Malyon or Michelle Magnusson in advance with any accessibility considerations. Malyon can be reached 204-727-7312 or MalyonM@BrandonU.ca, while Magnusson can be contacted at 204-727-9759 or MagnussonM@BrandonU.ca. 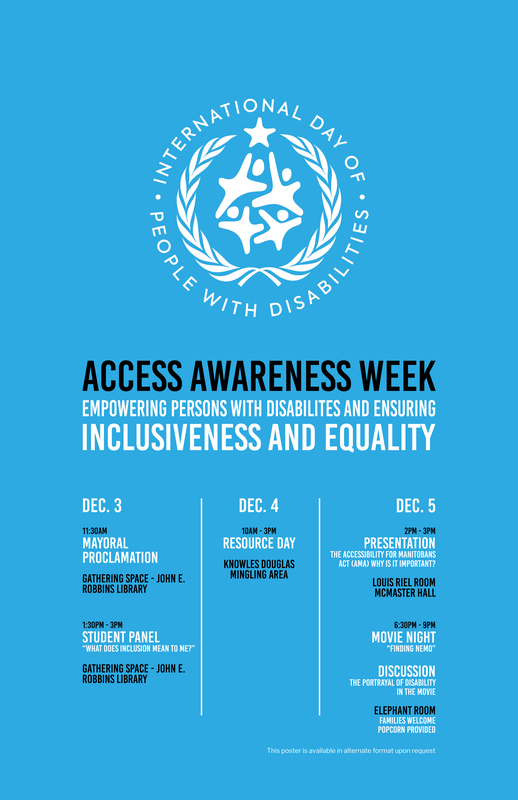 Join us in welcoming Mayor Rick Chrest who will be signing a Proclamation for the International Day of Persons with Disabilities on Dec. 3, 2018, and Brandon University Access Awareness Week from December 3—5, 2018. Join us to hear a BU student panel to learn about their experiences with disability and inclusion. Please join us for a reception welcoming the Canadian Federation of Students, Manitoba. Find out about services and programs in the Brandon area available for those experiencing disability. Presentation —The Accessibility for Manitobans Act (AMA): Why is it important? Listen to a presentation on the groundbreaking government act. Learn what it means for all Manitobans. Join us in watching “Finding Nemo.” Following will be a discussion about portrayal of disability in the movie. Families are welcome. Popcorn will be provided.